What are the signs of a strawberry allergy? Learn about this and other risks in adults and babies, and future hope, such as the "Sofar" strawberry. As much as most of us love strawberries, a strawberry allergy can lead to a potentially life-threatening situation for some people. An allergic reaction of any kind can lead to "anaphylactic shock", a condition in which the person's airway squeezes itself shut, and the person's blood pressure drops dangerously low. The closing of the airway causes the person to be unable to breath, and the low blood pressure leads the lungs to fill with fluid, while at the same time preventing enough blood from reaching the brain, the heart and the other organs of the body. In short, in almost every way possible, the person's body is starved for oxygen. In as little as five (5) minutes, the person's brain can be permanently damaged, sometimes fatally. A person in this condition needs IMMEDIATE help! What are the most common signs that a person may be having a reaction to a strawberry allergy? The person begins to have difficulty breathing; there is swelling of the face, arms, hands, and/or other parts of the body; or the skin turns red and/or appears to have a rash (a condition known as "hives"). These symptoms do not always happen, and they are not the only possible symptoms! They are the most common, but even if none of them occur, if you think an allergic reaction may be happening, GET HELP IMMEDIATELY! American statistics indicate that 1-4% of adults and 6-8% of children have some type of food allergy. However, less than a tenth of those cases (less than 1% of both adults and children) are a difficulty with strawberries. A strawberry allergy is most common in a baby because the immune system is still developing. If you are one of those rare individuals for which a strawberry allergy is a problem, you need to avoid them completely! Even cooking strawberries is not enough. There are some foods for which cooking is helpful, but strawberries are not one of those foods. Click here to open a page from the United States Food and Drug Administration (FDA) with more information on how to live with food allergies. This is a truly sad situation for the strawberry allergy sufferer, but there is some hope for the future. Scientists at Lund University in Sweden have found evidence to support claims by strawberry farmers that white, immature strawberries never seem to cause allergic reactions. A strawberry allergy is not the only thing to worry about with strawberries. Besides the Fra a1 allergen, the strawberry also makes chemicals called "oxalates" and "salicylates". Anyone who has ever had kidney problems, especially kidney stones, may need to avoid strawberries, because oxalates tend to cause the kidney to make kidney stones. Speaking with a physician about this is advisable. Salicylates are chemically similar to aspirin. While the amounts of salicylates in strawberries are rather low, it may be advisable to consume less of them, or even avoid them entirely, in certain situations. For example, if you are taking blood thinners, have hemophilia, or have some other reason why your blood may have difficulty clotting, then eating strawberries may make your condition worse. "There is not data as to other forms of salicylate other than aspirin associated with the development of Reye's Syndrome, but until further research has answered this question, we recommend products listing these substances not be used at all in children and adolescents, because a virus may already be present before symptoms appear." It should be noted that almost all fruits and vegetables have some amount of salicylates, not just strawberries. As always, it is recommended that you speak with a doctor about any concerns you may have. Strawberries can also cause problems for people with hemachromatosis, a group of conditions which cause people to retain too much iron in their bodies. Most common among people of northern European ancestry, about 1 in every 200 Caucasians in the United States are highly susceptible to hereditary hemachromatosis; individuals from other groups also develop the disorder, though at lower rates. This makes the illness one of the most common in the U.S. among disorders with a genetic component. Hemachromatosis can cause other devastating illnesses, such as arthritis, cirrhosis of the liver, diabetes, heart arrhythmias, and thyroid deficiency. Strawberries seem to increase the absorption of iron into the body. Care should be taken to avoid ingesting too much iron if you eat a lot of strawberries, and strawberry consumption may need to be reduced or eliminated entirely for those with a diagnosis of hemachromatosis. Of course, consulting your physician is always recommended to help insure that your diet is not harmful. For more information, click here to open a new window with a page from the National Digestive Diseases Information Clearinghouse (NDDIC). Yet another potential health concern is chemical residues on strawberries. If you grow your own strawberries without using pesticides or herbicides, or if you buy strawberries from a source that you know grows "organic" strawberries, then you may not have any problem. However, if you buy strawberries without knowing that they are grown "organically", then you might decide to take additional steps to reduce your chances of exposure to any hazardous chemicals. How concerned you should be about chemical residues also depends on where in the world that your strawberries are grown, as countries differ in how successfully they regulate food quality. One important thing that you can do is simply to rinse the fruit thoroughly in warm water. Using your fingers to rub over the surface of the berries while holding them under running water will remove quite a bit of contamination (you may prefer to wear gloves while doing this). 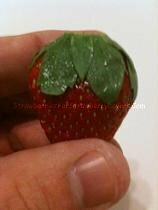 Another option is to use a knife to "peel" the strawberry, that is, to shave off and discard the outside of the fruit. This is especially effective at removing any chemical residue that might be down in the crevices around the strawberry seeds, and it has the added benefit of removing the hard seeds as well. If you do peel your strawberries, they should still be rinsed after peeling. As you can see, there are quite a few possible health risks if you eat strawberries. A strawberry allergy is a serious condition, and most people know that, but most of the other risks here seem to be relatively unknown. It should be noted that this list is not intended to be complete, and there may be risks that no one has even noticed yet. But if you follow the advice of your physician, then you, too, will likely be able to enjoy the World's Happiest Fruit!